A learning disability, or specific developmental disorder, is a disorder that inhibits or interferes with the skills of learning. Under federal law, public schools consider a child to be learning disabled if his or her level of academic achievement is two or more years below the standard for age and IQ level. The Fourth Edition Text Revision of the Diagnostic and Statistical Manual of Mental Disorders ( DSM-IV-TR , a handbook that mental health professionals use to diagnose mental disorders) uses the term learning disorder and defines this as cognitive difficulties arising from brain dysfunction. It is estimated that 5% to 20% of school-age children in the United States, mostly boys, suffer from learning disabilities. Often, learning disabilities appear together with other disorders, such as attention-deficit/hyperactivity disorder (ADHD). Learning disorders are thought to be caused by irregularities in the functioning of certain parts of the brain. Evidence suggests that these irregularities are often inherited (i.e. a person is more likely to develop a learning disability if other family members have them). Learning disabilities are also associated with certain conditions occurring during fetal development or birth, including maternal use of alcohol, drugs, and tobacco; exposure to infection; injury during birth; low birth weight; and sensory deprivation. The three most common academic skill areas affected by learning disabilities are reading, writing, and arithmetic. Some sources estimate that between 60% and 80% of children diagnosed with learning disabilities have reading as their only or main problem area. Learning disabilities involving reading have traditionally been known as dyslexia; currently, the preferred term is reading disorder . A wide array of problems is associated with reading disorder , including difficulty identifying groups of letters, problems relating letters to sounds, reversals and other errors involving letter position, chaotic spelling, trouble with syllabication (breaking words into syllables), failure to recognize words, hesitant oral reading, and word-by-word rather than contextual reading. Writing disabilities, known as dysgraphia or disorder of written expression , include problems with letter formation and writing layout on the page, repetitions and omissions, punctuation and capitalization errors, "mirror writing" (writing right to left), and a variety of spelling problems. Children with dysgraphia typically labor at written work much longer than their classmates, only to produce large, uneven writing that would be appropriate for a much younger child. Learning abilities involving math skills, generally referred to as dyscalcula (or dyscalculia) or mathematics disorder , usually become apparent later than reading and writing problems—often at about the age of eight. Children with dyscalcula may have trouble counting, reading and writing numbers, understanding basic math concepts, mastering calculations, and measuring. This type of disability may also involve problems with nonverbal learning, including spatial organization. In order to meet the criteria established by the American Psychiatric Association (APA) for these various diagnoses, the child's skills in these areas must be significantly below that of their peers on standardized tests (taking age, schooling, and level of intelligence into account), and the disorders must significantly interfere with academic achievement and/or daily living. 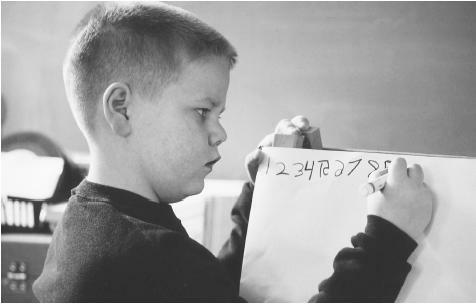 This eight-year-old boy has a learning disability that causes him to write some of these numbers backwards. Bowman-Kruhm, Mary, and Claudine G. Wirths. Everything You Need to Know about Learning Disabilities. New York: Rosen Publishing Group, Inc., 1999. Wong, Bernice, ed. Learning About Learning Disabilities. San Francisco: Morgan Kauffman Publishers, 1998. Learning Disabilities Association of America (formerly ACLD, the Association for Children and Adults with Learning Disabilities). 4156 Library Road, Pittsburgh, PA 15234-1349. Telephone: (412) 341-1515. Web site: <http://www.ldanatl.org> . National Center for Learning Disabilities. 381 Park Avenue South Suite 1401, New York, NY 10016. Telephone: (212) 545-7510, or toll-free at (888) 575-7373. Web site: <http://www.ncld.org> .